Material selection at Nova has been a strong point of our business. We’ll pour the metals that other investment foundries won’t or can’t due to lack of confidence and consistency. 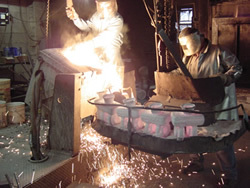 Castings are produced in over 100 alloy compositions including all grades of stainless steels, nickel and cobalt base superalloys, alloy steels and plain carbon. Tool steels and selected bronzes, iron and aluminum alloys are also available.